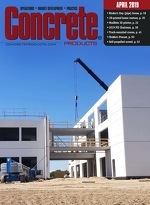 Central Concrete Supply Co., the northern California business of U.S. Concrete Inc., has left its signature on a finely detailed, 3D model of the Point Lobos State Marine Reserve, located south of Monterey along the central coast of California. A frequent critic of methods behind the U.S. Green Building Council’s LEED rating system, the American High-Performance Buildings Coalition (AHPBC) affirms support of the International Codes Council transparent process for developing the 2015 International Green Construction Code (IgCC). Winchester, Va.-based Shockey Cos. has announced a series of executive promotions positioning the next generation of leadership for its concrete and construction operations, naming Jeff Boehm president of Howard Shockey & Sons Inc. and Tom McCabe president of Shockey Precast Group.